Like so many other families, the planning and celebration of holidays was dominated by my grandmother. She was in charge of deciding the menu, which didn’t often change much. She would delegate tasks to other family members and we would fall in line. She would decide when to begin eating and when the celebration was over. She was the glue that held different parts of the family together and ensured we got together a few times a year to eat well and enjoy each other’s company. For some of us she was a second mother. She seemed to always be making sure we got something for our birthday, Christmas, or Easter. In her older age she relinquished the role of doing the large share of cooking for our gatherings. Some years it was a combination of my mom and older cousins, sometimes my sister was involved. In the last few years of her life, my sister and her fiancé moved in to help with her end of life care, this seemed to hand the task of cooking holiday meals at grandma’s house to my sister. This is where I come in, I was co-cook for a few of these meals and I always was home for Thanksgiving and Christmas. The job is easily adoptable because my grandma taught all of us to cook her recipes, we know them by heart and without measurement. My grandma passed away last August, days after her 83rd birthday. Fortunately we were able to care for her until the very end. A loss of a loved one so dear to us left us reeling. Many firsts were now in the form of “first _____ without grandma.” We didn’t have the energy to hold a large family Thanksgiving. I didn’t celebrate my birthday, I wouldn’t have a wacky cake or brownies. I was a little apprehensive about Christmas and New Year’s, two holidays I had almost always spent in the company of my grandma. Christmas was a time to spend time around loved ones and eat an unreal amount of food, while New Year’s was always celebrated with a thimble full of brandy to bring good luck in the upcoming year. Christmas was different. It wasn’t bad, but it was new. 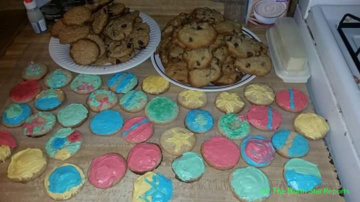 My mom, sister, and I made many batches of cookies on Christmas Eve. We decorated the tree, and this year it featured “Baby’s First Christmas” ornaments. Our Christmas was very much about us being together as a family, but also about my niece. Spending so much time watching her open her presents made my top 10 most memorable holiday memories list. 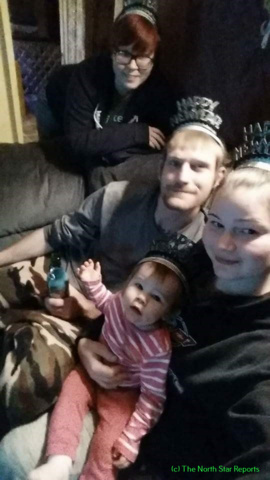 New Years was fun and goofy, my sister and I had a few drinks to celebrate my new legal rights as a 21 year old, and we even took a family picture complete with cheap, sparkly crowns. 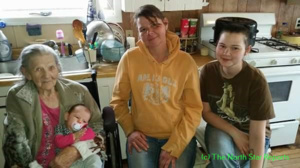 The role of patriarch skipped a generation, as my sister now seems to be the one to take on the full role of organizing holiday gatherings, though I am always available to stir things and ‘baby sit’ a turkey or ham. I know that because my grandma is gone, our family gatherings will not be as large as they used to be; rather they seem to be more intimate, immediate family celebrations. As I look forward to Easter with my sister, brother in law, brothers, niece, and parents I am both nervous and excited. No longer will I see 20 plus cousins at Thanksgiving or Christmas, but I am grateful I have my parents, siblings, and my niece to make new traditions with. The word Puja stands for worship. Durga puja, the worship of goddess Durga, is one of the biggest celebrations in the Eastern part of India. It is known by various names in different states. In the Western part of India it is called Navratri and in the North it is known as Dusshera. It is nine days long celebration and the start is marked by Mahalaya which is a day prior to the first day of the puja. The word Mahalaya stands for the great beginning. On the day of Mahalaya people wake up at four in the morning to listen to the recital of the great victory of goddess Durga on the radio. When the evil, Mahishasur(meaning the great demon) started taking over the world the gods in heaven tried to stop him with all the efforts they could put in. However, he had the blessing that no man could ever defeat him and thus all gods failed. In an effort to defeat him they decided to create a creature so strong and powerful that it contains all the powers of every god in heaven. They created a female god and named her Durga. She had ten hands and had a weapon in eight hands. She uses two hands to hold the trident and one hand is free, blessing her disciples. Her strength is symbolized by the tiger that she rides. She fights the evil off with her power and eventually defeats him by impaling her trident in him. On the seventh day, Maha Saptami, everyone gathers in the afternoon for a feast and in the evening they come together to dance on the beats of the dhak (a musical instrument). The essence of Durga puja is incomplete without dhak. It is a drum like instrument played with the help of two sticks. People dance to the beat of the instrument every time they hear it. The eighth day, Maha Ashtami, is the most important day. People fast in the morning and pray to Maa Durga by giving anjali, a form of prayer where you repeat all the chants after the priest and then ask Maa Durga to grant your wishes. A lot of people decide to do nirjalavrath which is fasting without drinking even a drop of water. The first drop of water that is provided is the charanamrita (Charan = feet, amrita= holy water) which means holy water from the goddess’ feet, meaning her blessings. The afternoon is followed by a delicious vegan meal. In the evening everyone gets together and people go around seeing the different pandals in the area. The festival is not limited to only the worshipping and music. 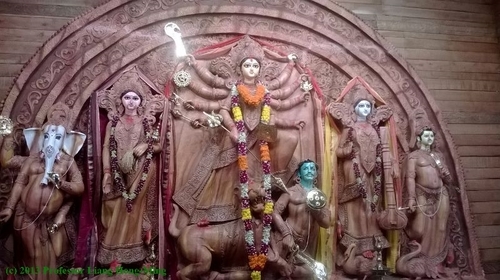 With the influx of the modern world and growth in economy, most districts host a numerous number of puja locations. 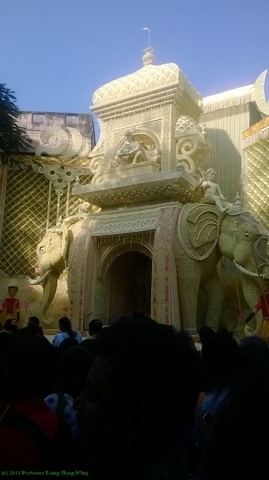 Each location has its own pandal and statues. There is a competition held in Kolkata (formally known as Calcutta) for which area has the best theme for the pandal for the year’s celebration. 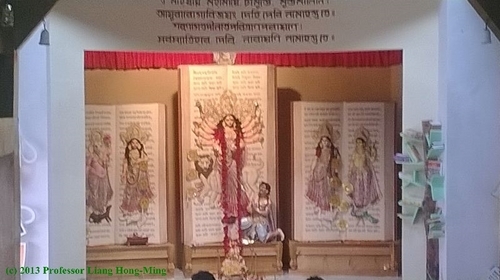 Everyone builds a unique pandal starting from the remake of the famous temples and architectures, to a very creative pandal representing the heaven and the fight between Mahishasur and goddess Durga. This year some of the themes were library, carving on one single wood log, etc. On the ninth day, Maha Navami, we have The Maha Navami Yajna (chanting of vedic mantra and offerings). This yajna is important because it is believed to get rid of one’s future troubles. The night of Maha Navami is the last night of celebration but the tenth night and the visarjan (submerging the statues in the water so the clay can melt away and settle on the sea/river bed) is also done with great enthusiasm. On the tenth day married women come to the pandal wearing a red and white saree and powdered vermillion (known as sindoor in Bengali), since it is the symbol of a married woman, much like the ring on your left hand in the Western world. They offer the sindoor to all the goddesses and gods by pouring a little on their feet and putting a dot on their forehead and also offer sweets (dessert items made out of milk mostly). Once they are done offering, they start the sindoor khela which is playing with the vermillion that was offered. They put the powder on each other’s face and offer each other sweets as a symbol of a healthy and blessed future. Later in the afternoon the statues are loaded on trucks and driven to the holy water of Ganges for the visarjan. People dance to the beat of either dhak or play music very loud to give Maa Durga a happy and grand departure. It is a procession where people dance like there is no worry in the world. They announce the departure of Maa Durga and her companions to everyone around them, even though the tenth day signifies the end of celebration and is usually a sad affair, the celebration uplifts the mood. And thus, the saying goes “ashche bochhor abar hobe,” meaning it will happen again next year. Photo #3 The entrance resembles medieval Indian palaces. With elephants adorning the gates and soldiers lined up, it looks like the era of the Kings and Queens have returned for a celebration so grand.